The Dutton engineers, the BBC National Orchestra of Wales, and conductor Martyn Brabbins have come together to deliver one of the best releases of classical music that I've heard this year. 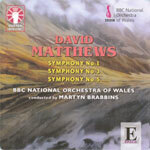 Here are three symphnies by David Matthews (b. 1943) who is clearly leading the way in symphonic writing in England - at least in his generation... His music is freely tonal, which means that his symphonies take from the structure of the great romantics, but his language moves in and out of standard tonality where the mood suits him. Unlike Peter Maxwell Davies, his atonal ideas are more meditative than strident, his colors more varied. His darker moods last only a few bars, and his transitions not as abrupt as Havergal Brian's. I found these symphonies cogently written, neatly phrased, and excellently performed. I'm perpetually amazed by the Dutton engineers (I do not own even a mediocre Dutton record). The sound is discreet yet full but not pushy. Symphonies 1 (1978) and 3 (1983-85) are single-movement works and are sturctured much like string quartets; in these works Matthews shows what he's learned about the articulation of ideas and how to moderate them. (His music is also nothing like Maw's or Sculthorpe's - both fine composers in their own way.) Symphony 5 (1999) makes fuller use of orchestration and has melodic hints of William Alwyn (without that man's lyrical palette). If one is to apply a label to Matthews, it must be that the man is a new sort of romantic; but I'll be swizzled if I know what kind. I can't stop playing this.